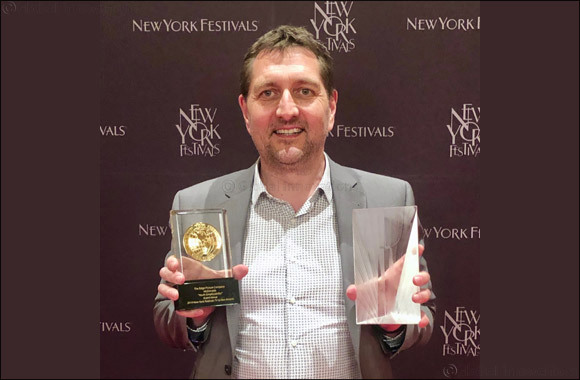 13 April 2019 - Doha, Qatar: The British award-winning film production company, which makes Doha home for its international office, The Edge, were crowned Production Company of the Year Worldwide for the 13th time running at the New York Festivals TV & Film Awards 2019. The company was also crowned Number ONE in Televisual’s Peer Poll 2019, and Number 2 in the overall Top 50 companies. The New York Festivals TV & Film Awards announcement was made during a Gala event that took place in Las Vegas, last Tuesday. These prestigious accolades honour content in all lengths and forms from over 50 countries. Embracing all aspects of the Television and Film industries, categories mirror today's global trends and encourage the next generation of story-tellers and talent. The Edge team won 4 GOLD, 5 SILVER, 4 BRONZE awards and qualified 4 times as FINALISTs, for their work with global clients such as McDonalds, Astra Zeneca, Infineum, Be The Business, UBS, HSBC, and Pinn. Moreover, The Edge was voted as the Number One Company in Televisual’s Peer Poll 2019, where peers, competitors, freelancers and clients, vote for the best company in the industry. The company was also ranked as Number 2 in the Top 50 Rankings, also by Televisual, based on various criteria including, but not limited to, company size, permanent staff, reputation among peers, and awards in London, New York and Cannes. Phil Blundell, Executive Directive at the Edge commented on the awards: “We’re incredibly honoured to receive these prestigious awards. It’s the 13th consecutive time we have been awarded Production Company of the Year by this renowned organisation, and it’s testament to the quality of work we bring to the industry and to our clients. The Edge are famous for being a proud British Company who started in the heart of London and expanded internationally with a regional office in Doha to serve some of the most important clients in Qatar and the region. With a total expertise of 28 years in the market, and 12 years in Doha, The Edge Picture Company are contributing to the country’s efforts towards achieving the National Vision 2030. Jamie Riordan, Head of Production in Doha at The Edge said: “There’s nothing more effective in communication than film. The power of moving pictures has been used for more than a hundred years to shape minds and change perceptions. By working with leading Qatari companies and partnering with the local private sector, we’re ensuring through our work that Qatar’s message reaches the entire world loud and clear. The Edge are known for their successful collaboration with some of the top-notch entities in Qatar including National Tourism Council, ExxonMobil, Sidra, Ooredoo, Qatar National Bank, Supreme Committee for Delivery & Legacy, and Qatar Petroleum.